OK, so you took the movie Elf a little too seriously. You live in NYC. You watch for Santa to crash land in Central Park. And you eat lots and lots of sugars and bypass the veggies. While that could work for Buddy the Elf, your teeth aren’t so fond of your diet. Maybe we could cut down on the sugars just a bit? In fact, the American Dental Association (ADA) does more than just stamp their logo on your favorite toothpaste. They’ve also created this list of seven foods that your teeth love. Of course, an apple-a-day keeps the doctor away. Maybe the dentist, too, except for twice-yearly exams and cleanings, of course! 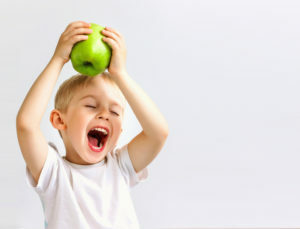 While fruits such as apples are sweet, they’re also high in fiber and water. The fibrous texture of the fruit also stimulates the gums. Think of it as a good scrubbing of your teeth and gums. The crunchiness of carrots increases your saliva production. Why is saliva good? Saliva rinses away bacteria and leftover food particles. Plus carrots are high in fiber and a great source of vitamin A. Your eyes will thank you for them, too! Unless you’re from Wisconsin, most people wouldn’t associate cheese with tooth health, but it is. A study in 2013 published in General Dentistry found that eating cheese raised the pH in the subjects’ mouths and lowered their risk of tooth decay. The chewing required to eat cheese also increases saliva production, which, as mentioned above, is good. Cheese also contains lots of calcium and protein, both of which strengthen tooth enamel. Leafy greens are on more “best” lists than Meryl Streep. While they are full of great minerals and vitamins for your overall health, leafy greens also are good for your teeth. They’re high in calcium for your enamel. They contain folic acid, a type of B vitamin that has numerous health benefits, including helping pregnant women avoid gum disease. Celery has the reputation for being bland and stringy. But, like carrots and apples, it’s kind of like a natural toothbrush, scraping food particles and bacteria away from your teeth. It also has lots of vitamin A and C, which is good for your pink friends, the gums. Almonds are a great source of calcium and protein and have little sugar. Plus, they’re great at filling you up. Add a quarter cup to lunch and throw some on your salad at dinner. If you eat more of these foods you can splurge on the occasional Buddy the Elf sugar binge and your teeth won’t beat you up about it. And when it’s time to schedule your twice-yearly exams and cleanings with the team at Prosthodontics of New York, give us a call at (212) 758-9690.